Elegant and easy condo living! 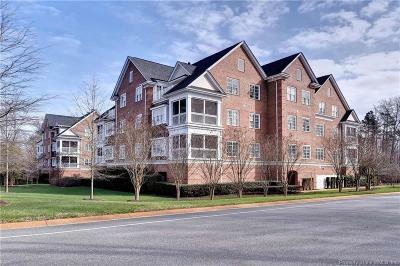 Experience the best in âdown-sizingâ opportunities in this beautifully appointed condo with a fabulous open floor plan. You will love the elegant great room that features a tray ceiling, plantations shutters, and is anchored by a wall of custom bookshelves and gas fireplace. The Spacious kitchen offers a gorgeous custom-built center island with extensive millwork, granite counters, terrific cabinet space & pantry. Perfect for entertaining, the dining room is adjacent & also offers access to the screened porch. The expansive master retreat features a tray ceiling & 2 closets. En-suite master bath w/large tiled shower & jetted tub. There are 2 spacious Guest BRs. BR3 features hardwood flooring & is currently utilized as a den. Distinctive details: extensive crown & chair mouldings throughout, plantation shutters, beautiful hardwood floors, ceramic tile in baths, large utility room, tons of storage & additional closet spaces, screened porch, secure ground level parking + storage. Compare the costs of maintenance of a single-family home versus care-free condo living. On an annual basis, condo living has proven to be more cost effective! ©2019 Williamsburg Multiple Listing Service, Inc. All rights reserved. Information deemed to be reliable but not guaranteed. The data relating to real estate for sale on this website comes in part from the IDX Program of WMLS. The IDX logo indicates listings of other real estate firms that are identified in the detailed listing information. The information being provided is for consumers' personal, non-commercial use and may not be used for any purpose other than to identify prospective properties consumers may be interested in purchasing. Information herein is deemed reliable but not guaranteed, representations are approximate, individual verifications recommended. All rights reserved. Last update 2019-04-22.